The translation is available on the KO Approach download section. We would like to thank our contributor, elda taluta, for the great work. And remember, should you wish to create your own translation, we will reward you with an Advanced license! We are happy to announce the most advanced and stable KO Approach – version 0.5.2 is here! It offers impovements and bugfixes over the previous version and is still less than 900 KB in size. KO Approach can now list processes currently running on your system. Simply insert the Running processes item into Approach Items and enjoy! You can choose to reveal the executable file of each process in Windows Explorer. Or, if your process is hanging and you don't mind losing unsaved data, choose Quit to terminate. Also, we have improved menu display by reducing flicker when menus appear. In case you have just received a License and need to activate KO Approach, the Registration tab now features improved Serial Number entry, automatically filtering out invalid characters and inserting dashes where needed. Plus, there are several minor improvements. We highly encourage you to upgrade to this version! 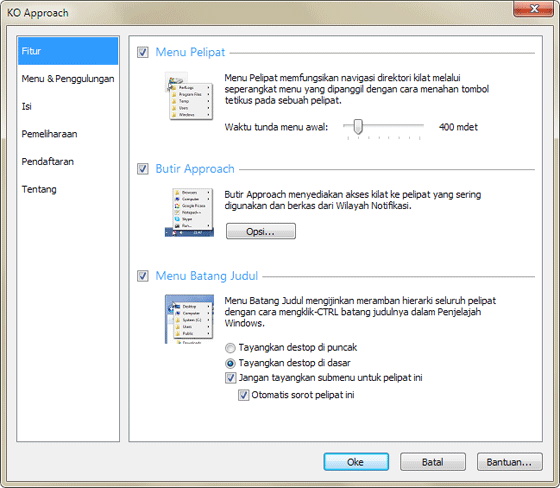 We're happy to announce KO Approach version 0.5.1 build 311.